Right now, I am sitting on the couch watching Beverly Hills, 90210 on Hulu Plus (I am almost done with the first season). I have watched all ten seasons, of course, but I am so excited to re-start the entire series now that it is available to stream. My dog is laying next to me on the couch snoring to his heart’s content. It is the cutest. Welcome to my Sunday (even though you won’t be reading this until Monday). I have cooked far less than usual lately, so I decided to get back into the swing of meal planning by cooking this Mom’s Sizzling Steak Marinade by Six Sisters’ Stuff. 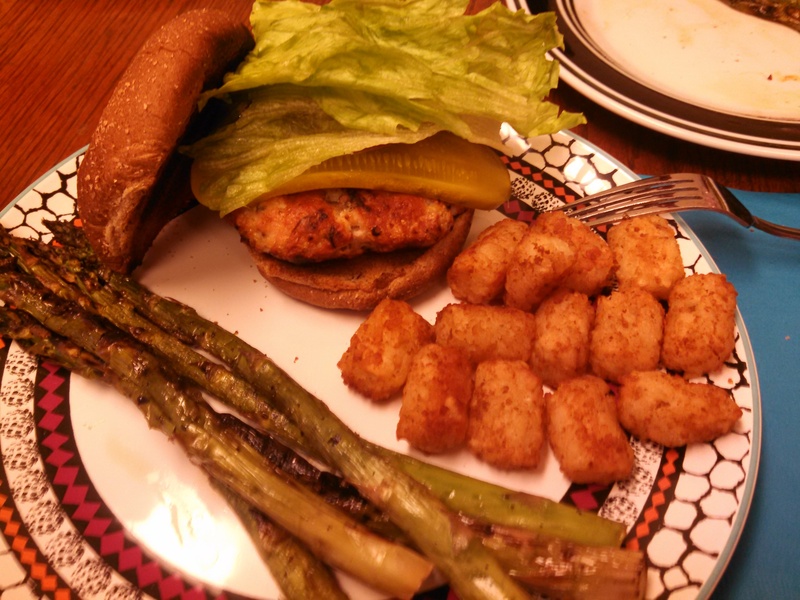 It was…well…to be perfectly honest, my husband and I couldn’t even finish eating it. We tried really hard and ate over half of our respective steaks, and then went to grab McDonald’s. I have never had a problem with a recipe by Six Sisters’ Stuff before, so I am pretty sure it may just be a fluke. It was so, so, so sour. At first, it just seemed a bit tart, and then it just got plain sour and was hard to swallow. It was like eating a dinner of Warheads prior to getting to the sweet candy center. The lemon juice and vinegar combination was just too much for us to handle. Granted – there are some alterations I made that may have played a role. 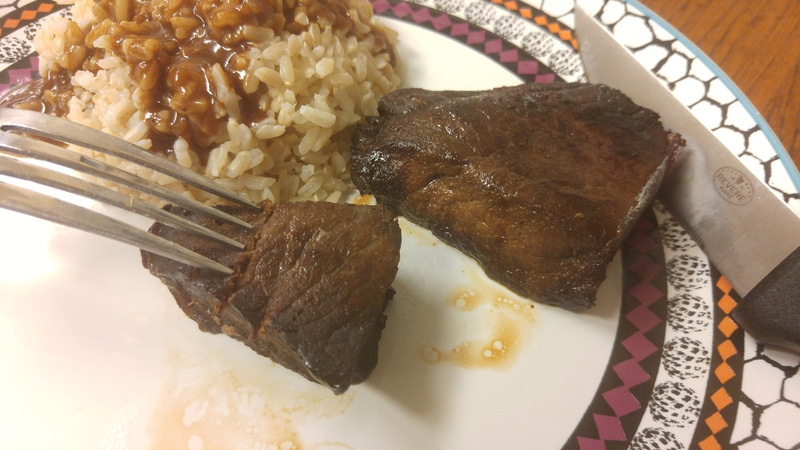 First of all, I used less than one pound of steak and did not change the marinade amount at all, therefore there was less meat to soak up the marinade. However, with how incredibly sour it was, it is hard to believe that more meat would soak it up entirely and evenly to make it not sour at all. I am curious to know if it works, but I will likely not give it a shot, since I am a little wary at this point. Second of all, I substituted red wine vinegar for apple cider vinegar, as I didn’t have any cider vinegar, and this may have affected it a little as well, however in many cases, vinegar is vinegar, so I am not sure how much of a difference it would have made. 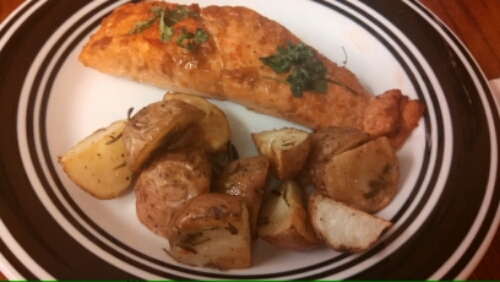 The other downside to this dish was not the recipe but rather the cook. Our grill is out of propane, so I decided to pan-sear the steaks and googled various ways to do this. One site said to sear each side on high for one minute each, then turn down the temperature to medium and continue to cook one minute per side, until each side has been cooked about 2-3 minutes, for a medium doneness. Well…let’s just say that didn’t happen. 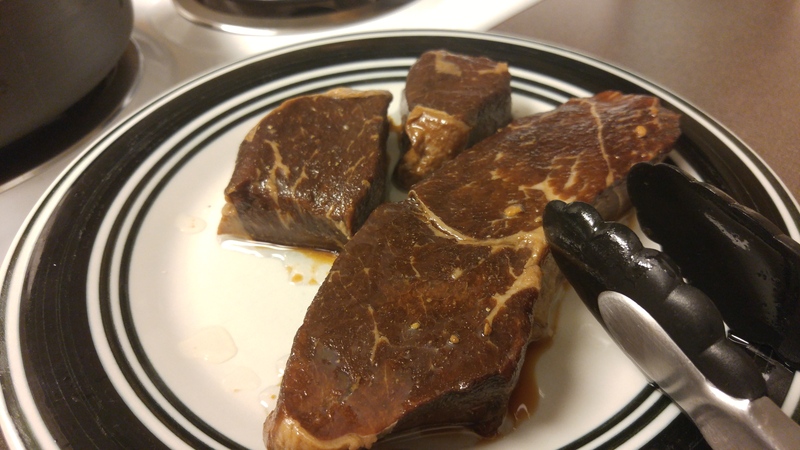 My husband’s steak turned out medium well and mine turned out almost well done (since mine had broken into two smaller pieces, they cooked much faster). 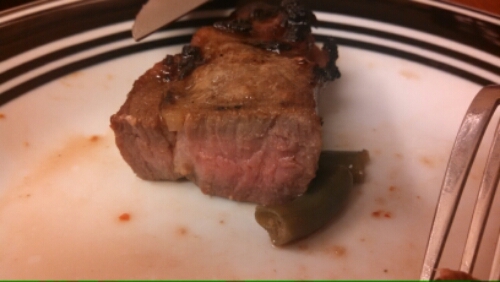 So there we are…eating sour, overcooked, non-juicy steak. 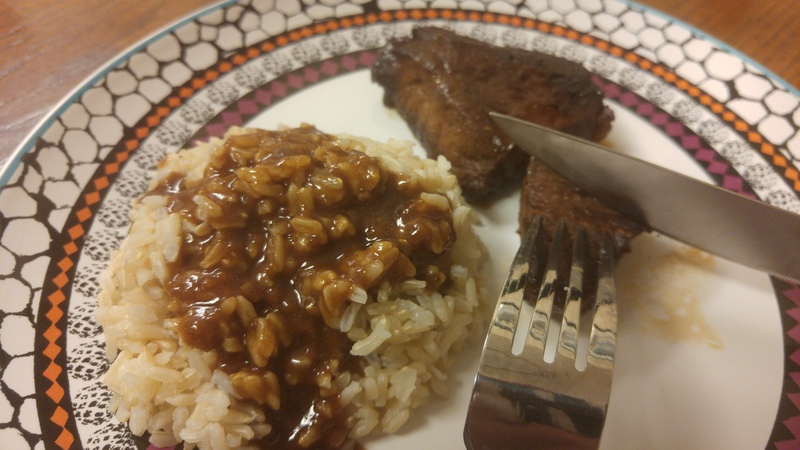 To make matters worse, I had decided to boil the marinade to make into a gravy for the rice I was serving it with (before I had realized how sour it all was). 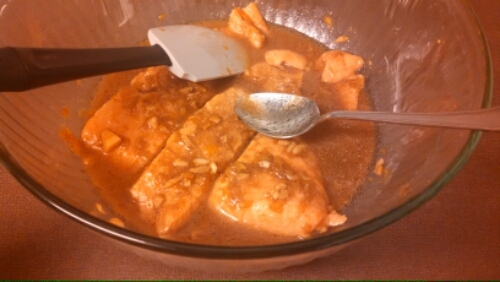 I added in several tablespoons of flour to thicken the marinade, which really did turn out to be a great looking gravy, but definitely ruined the rice for us as well. As a final note, when we returned from McDonald’s later that night, the entire apartment reeked of vinegar. What happened??? 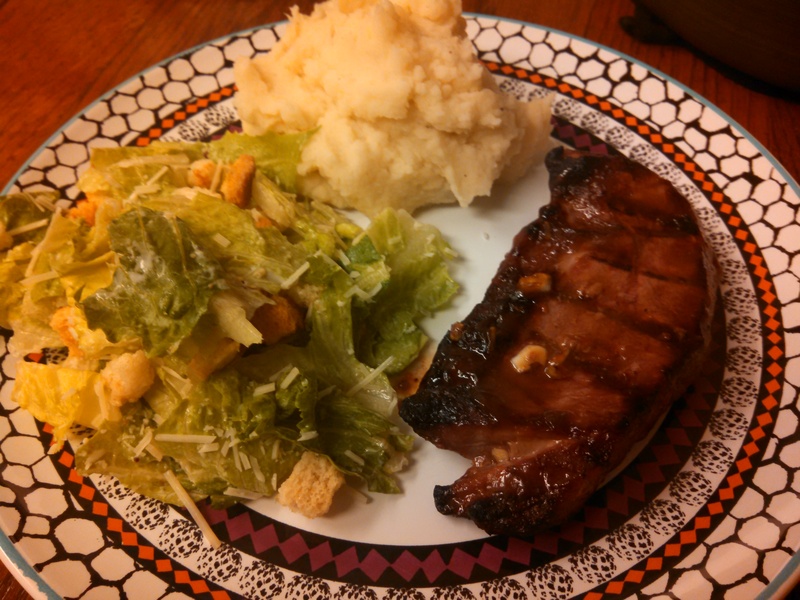 If you are looking for a surefire steak recipe, go with this juicy marinated steak recipe also from Six Sisters’ Stuff and is linked on the other recipe page. It looks much better and I wish I had gone with that! 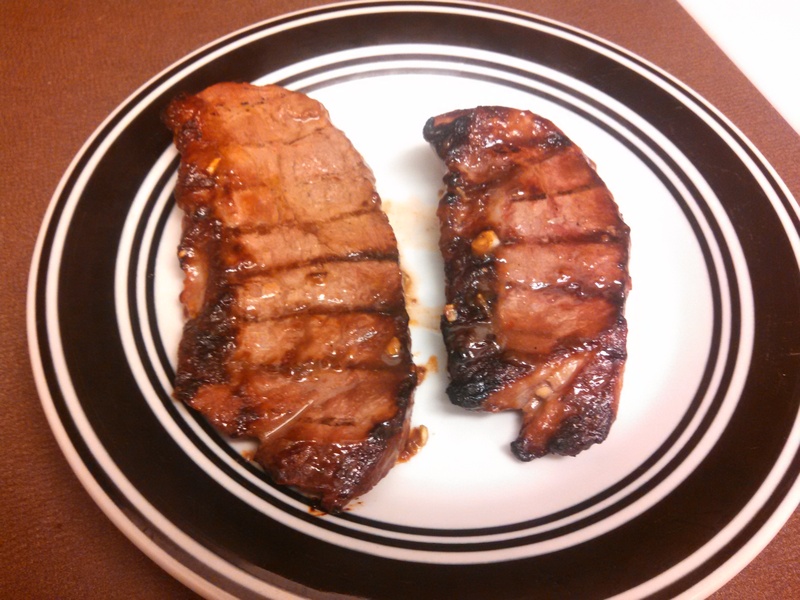 -Mix all ingredients together in a Ziploc bag or an airtight container and add 2 pounds of steak. -Refrigerate the steak and marinade for 8-24 hours. -Grill over medium-high heat to your liking. Maybe I didn’t even use a recipe. Maybe I just threw them together, which is entirely possibly. In any case, I still wanted to document them, cuz they were delicious. 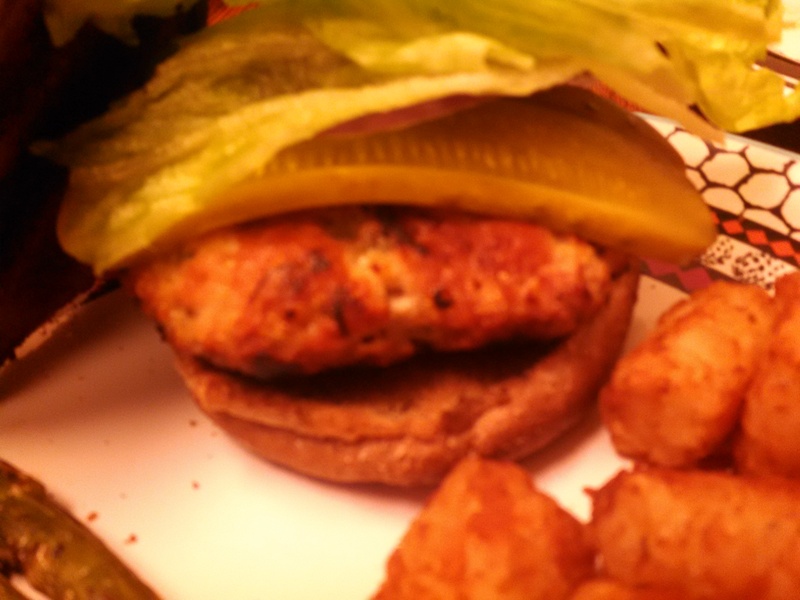 Grilling turkey burgers in the summer is an amazing and lightened up way of having burgers and quite honestly, the difference between beef and turkey, when prepared and cooked right, is very miniscule. As you can see, we also love to grill asparagus. So, so delicious. What are your favourite items to throw on the grill? I have been sitting on this recipe for WAY TOO LONG. Like two months. Well…less than that. But still a really freaking long time and I am just going to bang out this post right now to get it over with. Deal? Good. 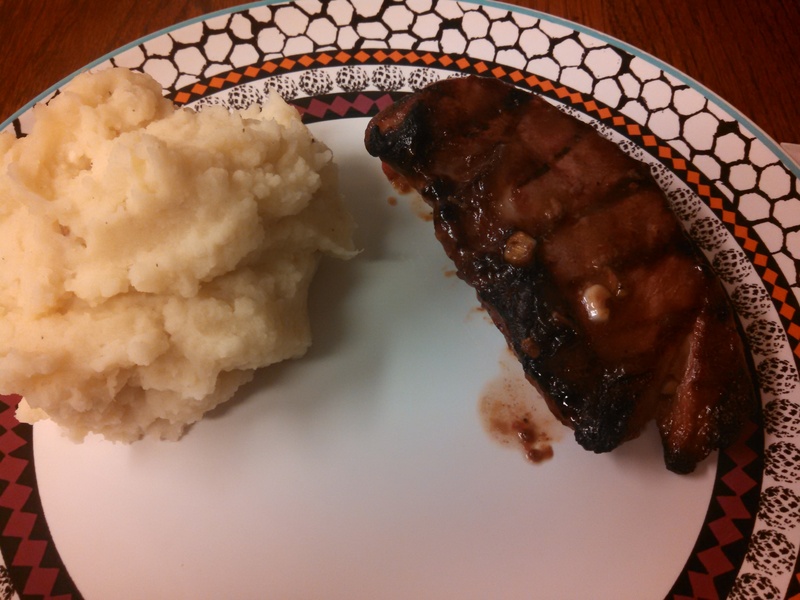 This Asian inspired steak recipe comes from Savory Sweet Life and was really good! As usual, I definitely recommend marinading it longer than just a few hours – overnight is always best! 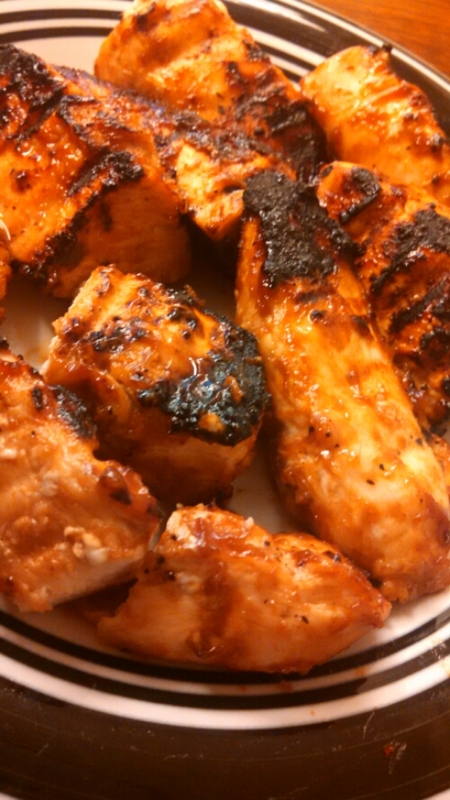 The longer you marinade, the longer the flavours get to be mixed into the meat. We also grilled this, because it was still summer aka “grilling season” – but if you’re like us, feel free to grill this steak year-round, or I am sure you can broil it, too. 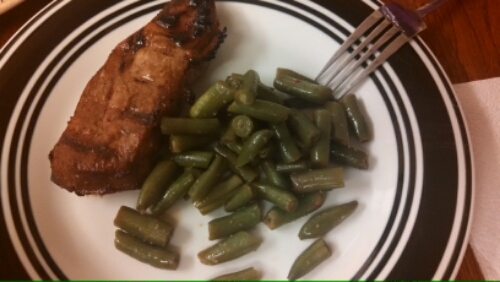 We paired it with green beans, but feel free to pair with another vegetable, stir fry, or rice! 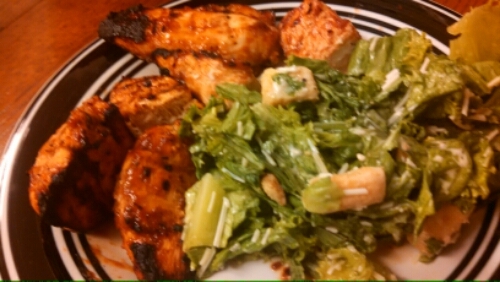 -Whisk all of the ingredients in a bowl, minus the steak and garnish. Then place the steaks and marinade in a ziplock bag and chill for at least 3-6 hours, or overnight (or in a bowl with a lid). 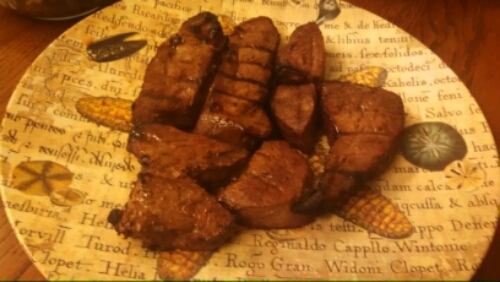 -Grill steaks on high heat for 4 minutes on each side for medium rare steaks (adjust cooking time based on your grill and preferred done-ness). -Allow steaks to rest for 5 minutes before slicing and serving. 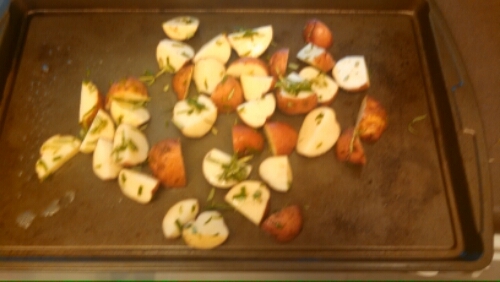 Sprinkle roasted sesame seeds and green onion slivers on top to garnish. Grilling season may be coming to a close for most people, but it never comes to a close for us! 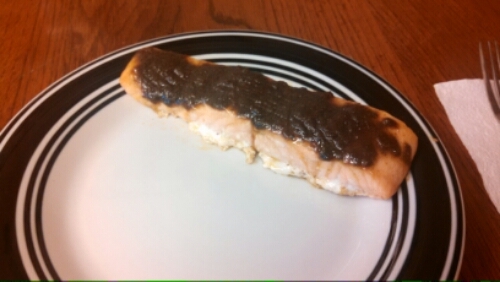 So if you are looking for a last hurrah for grilling, this cedar-plank salmon recipe from Real Simple is one option! As you can see in the picture below, there is a LOT of topping on it. 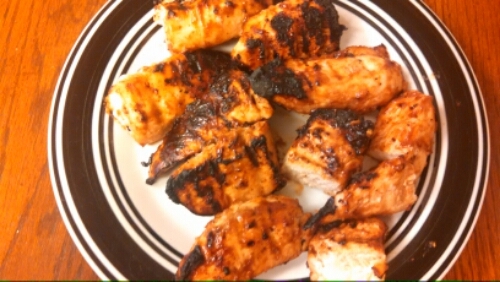 I used far less salmon than the recipe called for, so I did my best to cut down the marinade/rub accordingly, but clearly I did not do a good enough job. I wanted to get the most out of my rub, therefore I just slathered it on. IT WAS SO SWEET. I cut down the brown sugar considerably, but there is just not enough of the other ingredients to counteract the sweetness. My husband enjoyed it, but I had to scrape most of the rub off of my piece in the end – once I did that, it was more of a nice hint of sweet and spice. 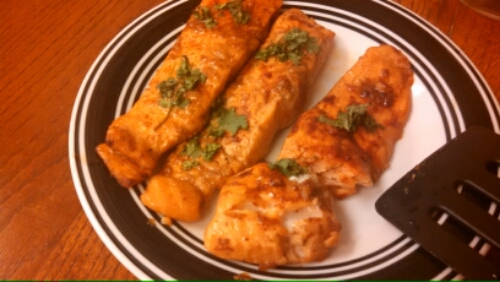 Because of this, I am going to post the recipe as it was on the original page, and you can adjust it for your own amount of fish. -Soak the plank according to package instructions (my planks require 2 hours). -Preheat the grill to medium. -Place the salmon skin-side down on the cedar plank. 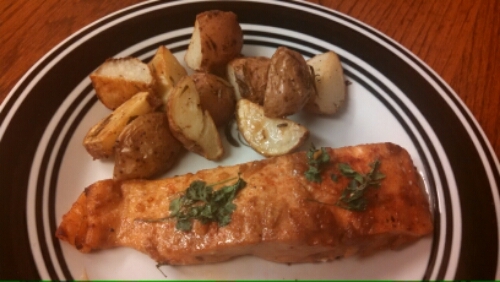 -Combine the brown sugar, oil, thyme, and cayenne in a bowl. 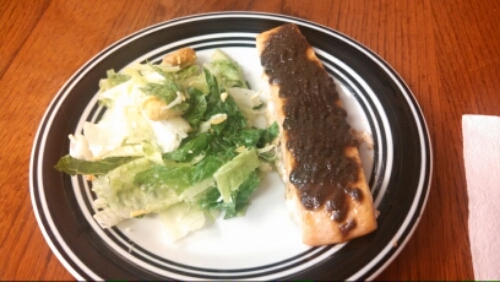 Spread over the salmon.